When the idea of high-concepts is applied to nonfiction for kids, it can create breakout titles for an author. Carla McClafferty, author of three such high-concept books, tells us how she does it. Question: Carla, your first book, Forgiving God, was an inspirational book dealing with the emotional crisis of the death of your child. Instead of following that with another inspirational book, you turned to trade nonfiction for kids, especially young adults. What drew you to this genre and this audience? Carla: My path into publishing is different from most. Many writers I know wanted to be a writer since they were children. They wrote short stories and kept their musings in a journal. While I never considered the possibility of becoming a writer—and my diary was mostly empty! So I really don’t have any background that prepared me to become a writer—except for the fact that I’ve always been a voracious reader and loved books in general. My first profession is as a Radiologic Technologist. I began writing the book even though I didn’t know what I was doing or what would happen to it when I was finished. Because it was emotionally difficult to write, the book took three years to write. During that time, I learned as much as possible about how book publishing works. I read writer’s magazines and books, and began attending an adult writer’s group meetings to learn as much about the way it works. I also attended local SCBWI conferences and meetings. I found so much information and help from children’s writers that it seemed to be a good fit for me. At some point during the writing that first book, I knew I wanted to continue writing when it was finished. I realized that by reading books of all sorts throughout my life, I’d been in training to be a writer without knowing it. By the time Forgiving God was published, I was already working on my first nonfiction book for young readers. Listening to the old adage of “write what you know,” I wrote about X-rays, my area of expertise. Farrar, Straus and Giroux published The Head Bone’s Connected to the Neck Bone: The Weird, Wacky and Wonderful X-ray in 2001. It was a great place for me to start. Question: What do you mean when you describe your work as “biography plus”? My “biography plus” mindset began with my first nonfiction book for young readers, The Head Bone’s Connected to the Neck Bone. This book is actually a biography of sorts where the main character is not a person but a thing: X-rays. I began the book at the discovery of X-rays, and followed along through the years focusing on how people used and misused X-rays in funny, dangerous, and even sad ways. I showed the use of X-rays plus art, archeology, paleontology, space exploration and so on. 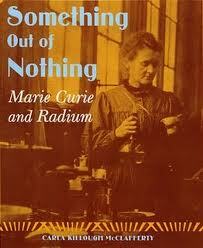 My second book in this genre was Something out of Nothing: Marie Curie and Radium. When I looked to see what competition there was for the book, I found countless books. I had to find a way to make my book different than all the other books on the market. In my research I’d seen some fascinating material about consumer products like toothpaste that contained radium back in the days when radium was considered to be good for your health—complete with photographs. I knew this material was exactly what I needed. It was fresh, interesting and fit perfectly with Marie Curie’s story. I found my “plus” material. Question: Can you explain what turns an idea for a children’s nonfiction book into a “high concept” idea? Isn’t high concept a term used in movies? How does it relate to children’s books? I believe nonfiction books can also be high concept books. 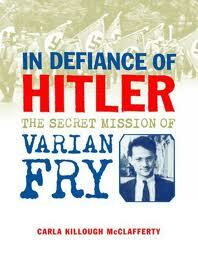 For example the concept for my 2008 book, In Defiance of Hitler: The Secret Mission of Varian Fry is this: A real life James Bond without the gadgets, Varian Fry, is an ordinary American journalist who led a double life in war-torn France. His cover operation was a relief organization, but undercover he was the mastermind of an elaborate rescue operation. Question: To sell your work, do you have a completed manuscript or do you use a proposal? If you use a proposal, what are the important things to keep in mind as you develop it? Does the high concept idea drive the proposal? Carla: At this point in my career, I can sign a contract based on a proposal. But in the beginning, I wrote the entire manuscript before I was offered a contract. Editors understand that sometimes writers can create a fabulous proposal, but can’t follow through to actually finish a manuscript. So, until you have a track record that proves you can deliver what you promised, then writers must do a lot of work without knowing if it will ever see print. It is part of the business. The high concept idea is the hook for the beginning, but then I make sure the proposal develops it further. I cover, for example, the availability of photographs, explanation of competing books and how mine is different, and ideas about how to market the book, and what I can bring to the project in terms of marketing. Question: Do high concept nonfiction ideas require an agent to sell, or can a writer sell it with a proposal on their own? Advantages/disadvantages both ways? The advantage of negotiating for yourself is that you are fully involved in every aspect of the contract; therefore you may understand it better in the end. It also reinforces the reality that publishing is a business, and you must watch out for yourself. The disadvantage of negotiating for yourself is that you are sometimes unsure of what you are doing which can make you feel overwhelmed. Question: Can you give us some tips on searching for and recognizing a high concept nonfiction idea for kids? Carla: You can recognize a high concept idea for a book because when you hear or see it you think “that is a great idea” or “I’ve never seen it done like this before.” As writers we need to train ourselves to notice how books and movies are marketed. In the movie industry, a brief pitch that explains what the project is about is called a logline. For example, a logline for the movie,“It’s a Wonderful Life,” might be: A troubled man finds out what would have happened if he’d never been born. In this example, the universal theme is the troubled man, but the fresh twist on it is that he gets to find out what life would have been like without him. A high concept book with a scientific tone is Written in Bone: Buried Lives of Jamestown and Colonial Maryland by Sally M. Walker. Its logline might be: After lying untouched for hundreds of years, the remains of various people from America’s colonial era are studied using modern science. Unknown people from long ago come to life as their bones tell the story of who they were, how they lived, and how they died. The universal theme is the cycle of life and death, and the twist is that the remains of these long-dead people have a lot to teach us about their lives and the times in which they lived. Question: What high concept idea is tickling your fancy right now? Carla:My latest book is another biography plus, another high concept book. 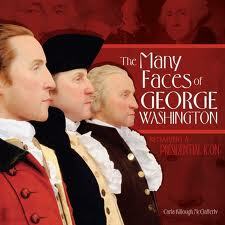 Published by Carolrhoda, Spring 2011, the title is The Many Faces of George Washington: Remaking a Presidential Icon. NOTE: This book has received BCCB and School Library Journal Starred Reviews! Using this book as an example, I can explain where this high concept idea came from. My favorite channels on TV are the History Channel, and Discovery Channel. One day I watched a History Channel special program about the making of the three life-sized representations of George Washington at three moments in his life, at the ages of 19, 45, and 57. These wax figures are currently on display at Mount Vernon, while duplicates are in a special traveling exhibit. I was mesmerized by the program because it showed how cutting-edge science and art combined to create these figures. While watching I thought about what a great book this information would make. From there, I thought that I was the writer who could make it happen, and immediately thought of ways to make it work together with a traditional biography. The seed of the idea was planted and it grew into a fully formed book proposal. In other words, I’ve taken the universal theme of George Washington, and found a way to put a fresh twist on it in a way that is original. I’ve come to recognize when a high concept idea is right for me. When I find a topic that interests me and I can find a way to make it into a “biography plus” — and I’ve connected with it on an emotional level. I want to write books that have meaning, books that will impact the reader. I must believe the books I write are worth the years they take for me to research and write. For example, I hope my new book about George Washington will change the way a new generation of young readers will perceive him. Instead of thinking of Washington as a stuffy old man, I want my readers to see him as he really was– a handsome, brave, humble hero who loved his wife and loved his country more than himself. 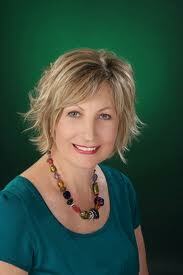 CARLA KILLOUGH MCCLAFFERTY is an award-winning author of nonfiction books. Yet writing is not her first career for Arkansas native, who is a Radiologic Technologist. Her debut book, Forgiving God, is an inspirational book that deals with the death of her youngest son, Corey. Next, she turned her attention to writing nonfiction books which include three published by Farrar, Straus and Giroux: The Head Bone’s Connected to the Neck Bone: The Weird, Wacky and Wonderful X-ray, Something Out of Nothing: Marie Curie and Radium, and In Defiance of Hitler: The Secret Mission of Varian Fry. Her books received a starred reviews in School Library Journal, Booklist and Jewish Book World. They have been recognized for excellence by the Junior Library Guild, Outstanding Science Trade Books for Children by the CBC, New York Public Library Books for the Teen Age List, IRA Children’s Book Award Winner, a NCTE Orbis Pictus Honor Book, ALA Best Books for Young Adult List, ALA Amelia Bloomer Project List, NSTA Outstanding Science Trade Book, National Council of Social Studies/Children’s Book Council Notable Social Studies Trade Book for Young People, Booklist Top Ten Sci-Tech books, NCTE Orbis Pictus recommended book, an International 2008 Society of School Librarians International Book Award Honor Book, Cooperative Children’s Book Council (CCBC) Choices 2009 list, and Arkansas’s 2008-2009 Charlie May Simon Reading List. McClafferty is a popular speaker who has presented workshop and keynote addresses at ALA, NCTE, national and regional SCBWI conferences, as well as various national and international conferences. Terrific and generous interview – thanks for sharing!